Just when Apple stock really needed some good news, it got some today (Monday) in the form of a 13-F filing from Warren Buffett's Berkshire Hathaway Inc. (NYSE: BRK.A, BRK.B). Those quarterly filings reveal what big investors like Warren Buffett's Berkshire were up to in the previous quarter. And in Q1 of 2016, Berkshire was buying up a lot of Apple Inc. (Nasdaq: AAPL) stock. Berkshire bought 9,811,747 shares of Apple stock, to be exact. And as with any move connected to the iconic Warren Buffett, Wall Street ate it up. Shares of AAPL stock rose about 4% today in the wake of the news, to just under $94 a share. The news took Wall Street a bit by surprise. After all, negative sentiment on Apple stock stretches back into the summer of last yea r. The Apple stock price is down 27% over the past 12 months, and nearly 11% just since Jan. 1. Another prominent investor, Carl Icahn, announced earlier this month that he'd dumped all of his AAPL stock. And Warren Buffett's reservations about the tech sector are well known. He rarely ventures there. And his poor-performing $10 billion investment in International Business Machines Corp. (NYSE: IBM) in 2011 would seem to have confirmed those reservations. But two fund managers Buffett hired in recent years – Todd Combs (2010) and Ted Wechsler (2011) – have no such aversions to putting money into tech. And Buffett has given both men wide latitude to manage their assigned portions of Berkshire's portfolio (about $9 billion worth apiece). Warren Buffett revealed in an email that one of his two lieutenants picked Apple. But Combs is the most likely, as he put some Berkshire money into Intel Corp. (Nasdaq: INTC) back in 2011. Still, the move left many "experts" scratching their heads. Yet here at Money Morning, the Berkshire-Apple news wasn't terribly surprising. We've known for a long time the value of AAPL stock. So the recent negativity left our team of experts unfazed. Not only has Money Morning been bullish on Apple for a long time, we've continued to make the case for the stock while most of the financial media were trashing it. Nearly a month ago, when most were agonizing over Apple's fiscal Q2 earnings miss, Money Morning Chief Investment Strategist Keith Fitz-Gerald was urging investors to ignore the short-term noise. "What people are missing is that the company is wrapping its future around everything from social media to mobile computing, data, and entertainment – not devices," said Fitz-Gerald. "That's all stuff that isn't properly reflected in the Apple stock price… but will be very shortly." Last week, as shares of Apple dipped to two-year lows, Money Morning Director of Technology & Venture Capital Michael A. Robinson advised investors to "carefully consider what the experts have to say… and then do the exact opposite." Concerns that we've reached "peak iPhone" are overblown, Robinson said. Sales in China have slowed in recent quarters, but the middle class there – a prime target market for Apple – is expected to quadruple over the next four years. 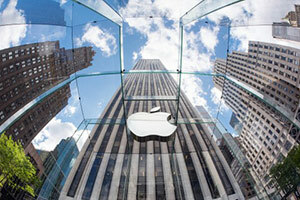 Apple is also making plans to tap into the high-potential market of India. The company is working with Chinese partner Foxconn to build an iPhone factory in India, and Apple CEO Tim Cook is visiting the nation of 1.3 billion this week. For one thing, we know Apple is working on new features for the iPhone – features that will encourage future upgrades. We're bound to see some on the iPhone 7 due out this fall. And then there's the long-term potential of the Apple Watch, which has plenty of time to prove its critics wrong over the next few years. Or Apple's ability to exploit the evolution of video from cable providers to Internet streaming. Or Apple's plans for an automobile. These are the kinds of catalysts Berkshire Hathaway is looking at, too. Even if one of Buffett's protégés actually pulled the trigger, they're still required to follow the tried-and-true Berkshire philosophy of investing in dependable companies with long-term value. In Apple, Berkshire obviously sees such value. And on top of everything else, AAPL stock is just plain oversold. The price/earnings ratio is just 10.5, far below the Standard & Poor's 500 average of 17. The company has more than $200 billion in cash. And the dividend yield is about 2.5%. The analyst consensus one-year price target, according to Yahoo! Finance, is $126.25. That's a 34% gain from the current price. But from what Fitz-Gerald sees, the analysts are way underestimating where AAPL stock is headed over the next few years. "I say Apple is worth $200 a share," Fitz-Gerald said. "Now's the time for investors to get on board at a discount before anxious sellers realize the error of their ways." Yep. Berkshire buying Apple makes perfect sense to us.